The object of the game is to get a higher point value when adding up all your cards than the dealer has without going over 21. Cards are worth their face value except picture cards are worth 10 points and the Ace is worth either 1 or 11, whichever gives you the better hand. You can pick as many cards as you want from the deck by pressing #, when you have enough cards press 0 to stay. 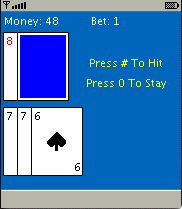 The dealer will then pick cards until it has 17 points or more. If you win a black jack (an Ace and 10,J,Q, or K) you win 1.5 times your bet unless the dealer gets a Blackjack also. To exit the game, you may have to hold down the back button on your phone for a few seconds.